“Yo, birdbrain!” “Hey, what are ya, a chicken?” Rather than taking offense to these common put-downs, I’m going to take them as compliments. Birds–let’s focus on chickens here–are smart. Social. Brave. They think and feel. In a lot of ways, they’re a lot like us. But it’s easy to forget that–if, indeed, we ever thought about it at all. Let’s think about it now. So how smart, social, and individual are chickens? “Contrary to what one may hear from the industry, chickens are not mindless, simple automata but are complex behaviorally, do quite well in learning, show a rich social organization, and have a diverse repertoire of calls. Anyone who has kept barnyard chickens also recognizes their significant differences in personality.” ~ Dr. Bernard Rollin, professor of Animal Science at Colorado State University. This is bad news for industrial growers, who bank on us (literally and figuratively) seeing chickens as dumb, unthinking, unfeeling and, ultimately, meaningless as individuals. Times eight billion-plus. It’s not wise to get too hung-up on intelligence, though (or that we share traits in common), when it’s actually sentience alone that matters. And chickens, unlike, say, chickpea plants, are sentient. New research shows that they display signs of empathy. 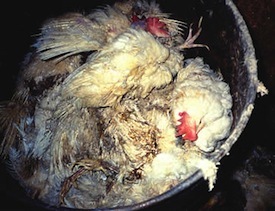 Let’s forego the litany of horrors endured by “layers” and “broilers” in factory farms. Most folks who are regulars at animals rights websites have the hateful facts seared into brains and hearts. But if you are new to exploring what you believe about the rights of animals, check here and here for details on the so-called life of an egg layer; for the painful, short life of a meat chicken, look here and here. If you prefer straight-forward narrative, try this and this. When chickens were domesticated from jungle fowl, no one divined the modern factory farm of 8000 years hence. Those early southeast Asian wild fowl lived the good life, as nature intended: in a social setting arranged in a hierarchy (pecking order), scratching about in the sun, hunting insects, perching in leaves, dust bathing and just squawkin’ around. 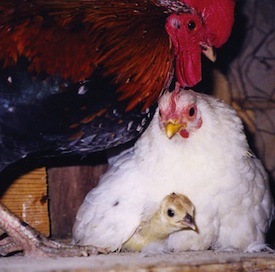 Mothers fearlessly protected precious chicks from predators. Today’s domestic chickens behave that way, too–when given the chance. But oh how slim that chance has become. “I was almost knocked to the ground by the overpowering smell of feces and ammonia. My eyes burned and so did my lungs, and I could neither see nor breathe….There must have been thirty thousand chickens sitting silently on the floor in front of me. They didn’t move, didn’t cluck. They were almost like statues of chickens, living in nearly total darkness, and they would spend every minute of their six-week lives that way.” —Michael Specter, New Yorker, April 14, 2003. Dr. John Webster, author of Animal Welfare: Limping Towards Eden, calls the treatment of chickens raised for food “in both magnitude and severity, the single most severe, systematic example of man’s inhumanity to another sentient animal.” And we haven’t even mentioned the quarter billion male chicks ground up alive every year–worthless to the egg industry. I entered “chicken wings” in a search engine and was nine pages in before I found a hit that didn’t pertain to eating (and it dealt with a lab experiment. Imagine having your body so thoroughly hijacked!) That little exercise drove home another point–about how corporate agendas shape our lives and rely on our continued, mindless participation to support their bottom line. To this end, and illustrating a perverse coupling of human appetites, I learned that an NFL lockout will “devastate” the wing industry. Bring it on! About time. I work with a wildife rehabber. We kept some hens in our shelter who’d been rescued from a live poultry store. They were debeaked and almost featherless when they got to us, but as soon as they got some space to move around, were busy exploring and talking to each other. I got to know them in the time we had them (we sent them to a sanctuary with more room). They had very distinct personalities, but what was interesting to me was their curiosity. They were just as curious about me, and other new things as cats can be. Their horrible pre-shelter life hadn’t torn it out of them. I don’t think compassion will help here, because most humans won’t let themselves be compassionate. Getting rid of the slavery, torture and slaughter of the meat industry should be seen as a matter of justice for these sentient beings instead. I should add that the issue isn’t just intensive factory farming, chickens suffer just as much in so called free-range situations, and, again, are slaughtered brutally. Again, a focus on compassion leads one to think that there are “humane” ways to enslave, which is untrue. Excellent, excellent post. And I’m very glad you pointed out that the question is not about how intelligent chickens are, or how much they are like humans, but a question of sentience. In the 18th and 19th centuries, Jeremy Bentham did a swell job in switching the debate from what animals lack (reason, language, tools – all of these supposed ‘lacks’ have no been undermined) to what animals are capable of. This lead him to the question, “Can they suffer?” And very clearly they do. Thank you so much for this wonderful, well-researched post! I carry a torch for chickens–something I’m picked on daily for by my MIT classmates–and it’s nice to see others do the same. I think the biggest struggle in improving conditions for chickens, as you mentioned, is getting the general population to abandon their unfounded views of the “dumb chicken.” It will be a struggle, one I hope is possible to overcome. We’ll see. I cry every day for these creatures we share the earth with, have been an activist for years, beginning with Henry Spira’s anti-vivisection fight and agricultural/factory farming issues since the 1970s. It appears a dent has not been accomplished, as even humane organizations have not impacted on these crimes against living things. Support and empathy on the part of blawg readers is encouraging, but the suffering continues. Thank you so much for this very informative post! Your extensive links are valuable as refreshers for those who know or guides for those who don’t. I have an understanding of what must have been going through your mind when you searched “chicken wings” and found unending pages of recipes instead. There’s a small flock of “egg-hen” refugees that I’m blessed to share my home with. Every now and then I want information about an issue they might be having… Either with their feet, legs, feather loss or egg irregularities — I swear, between the unending links to “poultry cooking” or illnesses caused by eating the birds – Answers are nearly impossible to find! We are indeed entrenched in seeing these lovely creatures as food or “disease” carriers. Thank you so much for giving due appreciation to these beautiful beings! Thank you all for your comments, and for continuing to fight the good fight for chickens and ALL exploited beings. I feel honored to count myself amongst you. RE: Lorien’s comments about compassion–this is something I struggle with in my writing. I do *not* believe that “compassion” is synonymous with “justice,” however, I also don’t believe that “compassion” is *always* synonymous with “humane exploitation.” Many who aren’t ready to embrace the idea of animal rights might someday come around to it through an appeal to their compassion–and if that’s what it takes to get them there, I’m good with it. quarter billion male chicks ground up alive every year–worthless to the egg industry. The sheeer number is mind boggling. It is like holocaust multiplied many times over. How dare we call ourselves human when there is no humanity left in mankind. Kathleen, I agree, *if* compassion brings people around, then I’m good with it. I just haven’t seen it much (not saying it doesn’t exist). That’s why I think, at bottom line, animals cannot be property, because then compassion becomes something that will *always* be trumped by owners’ interests. but how to get there is…as you say…the issue. I just haven’t seen the focus on compassion (used by most large animal advocacy orgs), bearing much real fruit in terms of changing the way animals are treated in this world. That’s kind of why I’d like to see a different, more justice-based focus, by animal advocates. It seems more honest.